Old textile mills still stand along the streets of Fall River, Massachusetts, recalling the 1800s and early 1900s, when the town was a major textile center. In their design of the new "Southcoast" offices of Meditech, architects at Payette Associates found an intriguing opportunity to create a building design that helps express a new direction for the town while also making reference to its past. Located on a 17-acre plot overlooking South Watuppa Pond, the building stretches along the site, with its north-facing side toward the town and its south-facing toward the water. 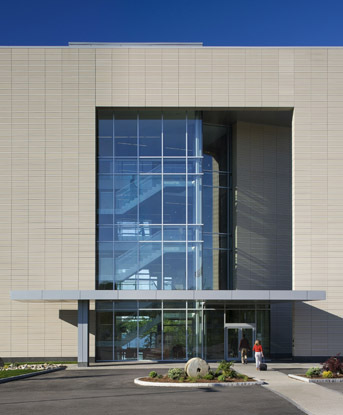 The design team took a distinct approach to each: "The design of the project's north facade references Fall River's mill heritage, while the south facade capitalizes on water views with a continuous glass wall," says Sheila Lemke, Meditech's architectural design director, who worked closely with Payette on the project. "This panoramic glass facade maximizes views to the pond and allows controlled daylight to reach deep into the open workstations," adds Lemke. "In addition, groups of multiple smaller windows located within a terra cotta rain screen system correspond with private offices and conference rooms." Firm Associate Jeff DeGregario, who also helped lead the project, said the team of architects wanted the north-facing side to "syncopate with mill architecture." They began their design work by looking at the proportion of windows to masonry in nearby mill structures. 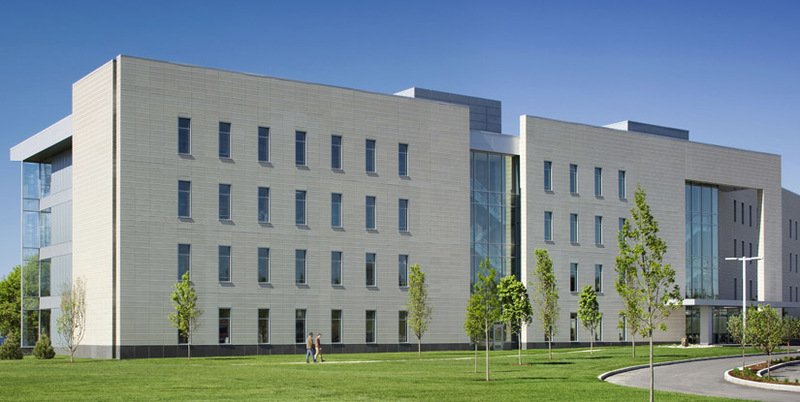 To capture the scale and rhythm they were seeking, the team settled on ventilated rainscreen facades from NBK Architectural Terracotta, a Hunter Douglas company. In addition, the [[color]] tiles also represented a natural clay material that provided a "forward-looking aesthetic," said DeGregario, complementing the brick construction prevalent in the area. It's no surprise that the Payette team wanted the updated look to refer to the fact that Meditech represents the future of Fall River, because it was led by James H. Collins Jr., a native of the town who is also a principal at the firm. "We wanted to draw out the idea of technology representing a renaissance for Falls River," says DeGregario. "This building needed to take a nostalgic look at the mills, while also having a progressive design that would fit the needs of an IT company... We definitely didn't want to create something that was trying to look like a mill, but in reality looked nothing like a mill." 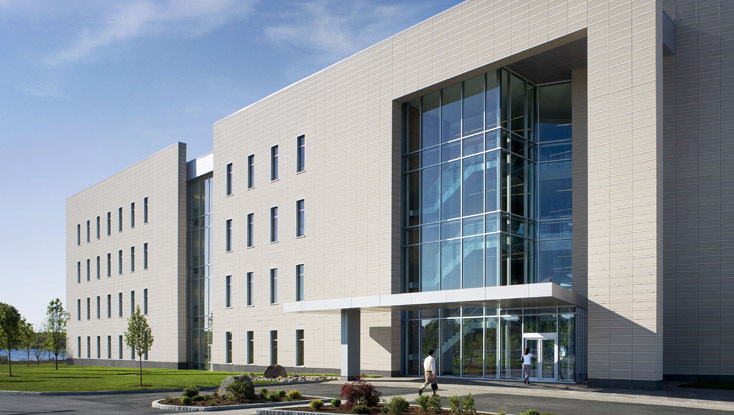 Meditech, which offers software solutions to the health-care industry, will employ over 500 people in Fall River - mainly client services, marketing, sales, and software developers - when the Southcoast building is fully occupied. 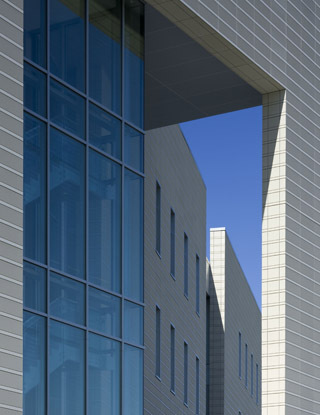 In selecting the facade, Payette worked with Sanford, the company who produced a panelizing system for the facade. Working together, NBK, Payette, and Sanford built dozens of mockups until they found textures that would create the desired effect. "We debated a long time about how to design the banding of broad and narrow tiles that we wanted: Should we make two tiles with a groove, or just one?" recalls Mark Banzak, a project manager on the Meditech facility. "In the end, the NBK extrusion allowed us to do both the effects we wanted within a single extrusion." 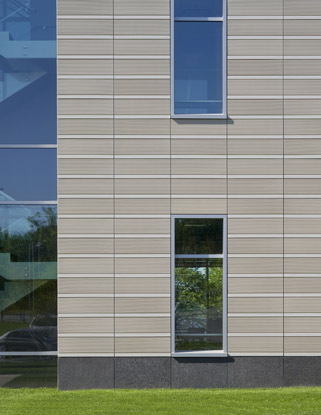 The terracotta on the 128,000-square-foot building not only provides an aesthetic effect, but also offers significant benefits due to its ventilated rainscreen structure. 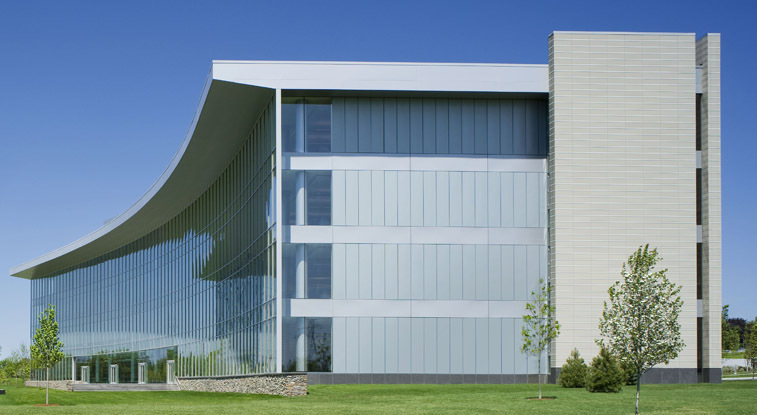 Unlike a traditional curtain wall, the facade is not caulked and sealed, but instead uses natural air-pressure equalization to keep moisture away. In addition, some energy benefits can be realized through chimney-effect cooling and reduced thermal bridging through to the interior. To test performance, the team built a wall and window assembly and subjected it to rigorous wind and rain tests to make sure it would fully control water penetration. We put it through the water test, then literally searched inside to find out if any water had come in," says Banzak. "The results convinced people - it passed on the first try." When it came time to install the facade, the Sanford panels were trucked to the site for installation. At 30 feet wide and a full story high, the strength of the panels allowed them to be dead-loaded to the ground, so that they required no other support. While the building has met most of its technical and aesthetic objectives, its ultimate success comes from the people who now occupy it. Michael Cabral, a manager of client services at Meditech who grew up and still lives in the Southcoast area, was among the first to move his group to Southcoast. "I've been at MEDITECH almost 20 years, and worked out of most of our buildings," he says. "They're all wonderful, but Southcoast is the best one yet."